Royal Caribbean's Managing Director of Australia, Gavin Smith, is calling once again on authorities at the Cairns, Australia to dredge the shipping channel and the swing basin. Smith said that while Rhapsody of the Seas was able to safely traverse the Trinity Inlet, it was "at the limit and edge of its physical capabilities". He said that Royal Caribbean would prefer the dredging take place to allow for easier and safer crossings as well as allow larger ships, such as Radiance of the Seas, to dock at the cruise terminal. 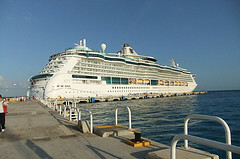 Currently, Radiance of the Seas is required to anchor off Port Douglas when she arrives in February 2012. Earlier in the year, Smith had asked for the channel to be dredged to allow the ship to dock even in poor weather conditions. Royal Caribbean prefers to dock rather than moor and force its passengers to be transported via tenders ashore. Cruise ship stops have always been a target for port cities because of the economic impact they provide, and Royal Caribbean's Radiance of the Seas proved that theory once again as it's estimated between passengers and crew $500,000 has been infused to the economy of Adelaide, Australia after a recent stop. Radiance of the Seas, which recently completed an upgrade, was delayed from leaving Fremantle by a day to help passengers that were the victim of Qantas airline grounding. Forty-nine passengers could not make it to Perth for the beginning of their 18-night cruise to New Zealand and so Radiance spent several days in Adelaide to wait. Tourism Minister Gail Gago said the direct economic impact from a ship the size of the Radiance over a day was estimated at $500,000, plus an additional amount to account for "a ripple effect". Royal Caribbean is targeting the Australian cruise market more than ever, which is an up-hill battle since P&O Cruises and Princess Cruises are far more established in the area. Radiance of the Seas is joined by Rhapsody of the Seas this year, with Voyager of the Seas due in next year. Royal Caribbean's Jewel of the Seas made her inaugural visit to the island of St. Kitts in the Virgin Islands yesterday. The ship, with a passenger total of 2,070, arrived after stopping in Barbados and docked at the island to allow its passengers a day of site-seeing. Most of these passengers enjoyed sun bathing, snorkeling, taxi tours and shopping. Jewel of the Seas is yet another big cruise ship to visit the island and will be part of the estimated 625,000 passengers expected between October 2011 and September 2012. Some bad weather in the Caribbean yesterday forced Royal Caribbean's Freedom of the Seas to miss a port of call. Freedom of the Seas was scheduled to stop at Grand Cayman yesterday but instead took a sea day. The main reason for not stopping at Grand Cayman was the waves were too big for tenders to safely transport passengers to and from the ship. 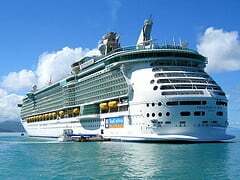 Freedom of the Seas was the only Royal Caribbean ship affected by the foul weather, whereas five Carinval Cruise ships and a Norwegian Cruise Line ship had to alter their itineraries in one way or another. After several meetings with three major cruise lines that touch Dominican ports, Deputy Minister of Tourism, Radhames Martinez Aponte, said the country should feel satisfied with the achievements so far in the event organized by the Association of Cruise Florida and the Caribbean (FCCA). Among the FCCA members is Royal Caribbean, who agreed to increase the amount of passengers that will visit the country in 2012-2013. "During the meetings we held with Royal Caribbean, MSC and Norwegian have promised us that from the 2012-2013 season will increase the number of cruise ships or cruise the ability of playing the Dominican Republic, which would raise the number of tourists coming this way, "said Martinez Aponte. Michael Roman, vice president for Latin America and the Caribbean for Royal Caribbean, acknowledged the efforts being made by the Ministry of Tourism to further improve the conditions of ports and the changes they have experienced. 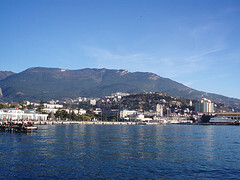 The Ministry of Infrastructure in the Ukraine agreed on Friday with Royal Caribbean to enter into a joint modernization of the passenger port of Yalta and Sevastopol, according to the deputy Minister of Infrastructure, Borys Kolesnikov. "Tuesday will start a joint working group. We plan to implement a project to lengthen the quay walls in order to enter the ports to vessels travel the highest class of the largest size" - Kolesnikov said in Yalta, where the deputy prime minister came to participate in the Black Sea Economic Forum. According to him, held talks on Friday were the first to the Ministry of Infrastructure of Ukraine shall, within 30 days to develop a "detailed roadmap" for further cooperation with Royal Caribbean. "The interest of Ukraine in the fact that tourists had a lot to all of the Yalta tourist facilities - restaurants, cafes and shops - was filled with" - he said. 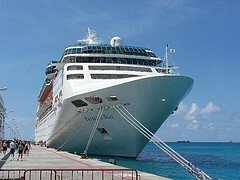 The 2011-2012 cruise season will kick off in St. Kitts with Royal Caribbean's Serenade of the Seas arriving on October 8th. Serenade of the Seas, a cruise ship with a capacity of 2,450 guests, will dock at Port Zante and make two calls in October with a total of 16 stops for the season. 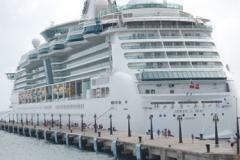 Serenade of the Seas will bring a total of 40,640 passengers during the 2011-2012 season. In addition, Port Zante will welcome Royal Caribbean's Explorer of the Seas six times as well as Navigator of the Seas and her 8 calls. At the Seatrade Europe in Hamburg, Germany the Seatrade Insider Cruise Awards 2011 were awarded and for Port of the Year, Falmouth was named the winner for 2011. Falmouth opened earlier this year on the coast north of Jamaica. Established by the Port Authority of Jamaica in partnership with Royal Caribbean and opened in March, Falmouth Harbor Theme represents an investment of about U.S. $ 270 million, with a pier with two piers, shops, restaurants and transportation center. Later phases of development planned for the immediate future include attractions, hotels, residences and more shops and restaurants. Falmouth, located on the north coast of Jamaica, is located between the popular destinations of Ocho Rios and Montego Bay, making it a convenient point of entry and exit to the island. 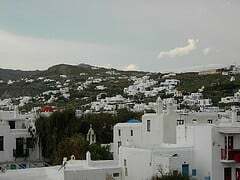 In addition, cruise ships have more than 60 shore excursions to choose from, including walks around the city.